Commissioned by oilman E. W. Marland and erected in 1930, the Pioneer Woman statue stands at the center of Ponca City’s civic life. The result of a sculptural competition, twelve of the world’s leading artists each produced a three foot bronze of their conception of the Pioneer Woman. The bronzes toured the United States and were a sensation in New York City where they were viewed by hundreds of thousands of people at the Reinhardt Galleries and written up in Time Magazine and by the New York Times. Over 750,000 cast votes for their favorite and Bryant Baker’s “Confident” was the selection of the people. In 1908 E. W. Marland came to Ponca City after losing his fortune in the Pennsylvania oil fields in the panic of 1907 and by 1920 had reestablished himself and started the Marland Oil Company in Ponca City with a fortune estimated at $85 million (roughly $910 million in modern dollars). Marland was a visionary and not only pioneered the use of geophysical techniques in the oil industry but was years ahead of his time as an employer providing housing, loans, medical care, and other benefits for the thousands of employees who worked at his refineries and pipelines. Standing Bear was a Ponca Native American chief who successfully argued in U.S. District Court in 1879 that Native Americans are "persons within the meaning of the law" and have the right of habeas corpus. Standing Bear spent many of his later years traveling the country to tell of his ordeal and to speak out for American Indians. In 1993 a twenty two foot statue of Standing Bear designed by Oreland C. Joe was commissioned and stands just south of Ponca City gazing over the Arkansas River Valley. Standing Bear ended his testimony in the landmark civil rights case with these words, "My hand is not the color of yours, but if I pierce it, I shall feel pain. If you pierce your hand, you also feel pain. The blood that will flow from mine will be the same color as yours. I am a man. The same God made us both." The Poncan Theatre was designed by the Boller Brothers of Kansas City in a mixture of art deco, classical Roman and medieval architecture. Opening in 1927, the Poncan hosted such famous entertainers such as John Phillip Sousa Band, Sally Rand, Will Rogers, and Ethel Barrymore during the heyday of vaudeville. In 1989 the theater was donated to the Poncan Theatre Company and a dedicated team of volunteers began to restore it culminating in a grand reopening and open house on September 18, 1994. The Big Spring was used by Indian explorers and cattlemen before the Cherokee Strip was opened to white settlement after the land run of 1893. B.S. Barnes came from Kansas in 1893 to participate in the Land Run and sold certificates for land turning prairie into a city in just five days. Barnes, who became Ponca City's first mayor, chose the location for Ponca City because there was access to natural springs and the railroad. The 63-acre Standing Bear Park includes a 22-foot bronze statue of Ponca Chief Standing Bear; a Museum and Education Center featuring tribal displays, traveling exhibits, and artwork; and a 60-foot diameter circular viewing court with seals of the six area tribes, Osage, Pawnee, Otoe-Missouria Kaw, Tonkawa and Ponca. The Mission of Standing Bear is "to educate all nationalities about the Native American heritage and the important role Native Americans have played in developing our country diverse culture; To promote better understanding and communication among all our nations cultures; To increase economic and educational opportunities for Native Americans; and To provide a catalyst to enhance the self-worth of all Native Americans." Lake Ponca Park is recreational facility located east of Ponca City. The stone shelters were constructed in the 1930's by members of the Civilian Conservation Corps (CCC), a US government program that took young men without jobs to build bridges, lakes and other projects during the Great Depression. The High School North stadium is another product of the CCC. In winter Lake Ponca Park is host to one of the largest displays in the "Festival of Angels" tour transforming itself into a sparkling multi-colored exhibit of animated displays. 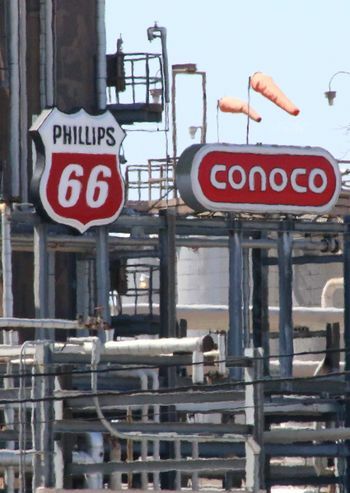 With over 1,000 employees ConocoPhillips Oil Company is the largest employer in Ponca City. Up until the 1960's Ponca City was headquarters to Conoco Oil Company and hundreds of engineers and scientists worked at Conoco's Research and Development Center in Ponca City. More recently ConocoPhillips has donated unused office space in their facility to host the University Multispectral Lab (UML), a testing center for sensor technology located at the Research East building of the ConocoPhillips complex. In 1966, the Ponca City Art Association purchased the eight-thousand-square-foot Soldani Mansion built for Anthony Godance Soldani, a member of the Osage Nation, at a cost of $92,000 in 1925. The Art Association is dedicated to enriching cultural life in North-Central Oklahoma by promoting, teaching, and nourishing the creation and appreciation of the visual arts through exhibitions and educational programs for children and adults. 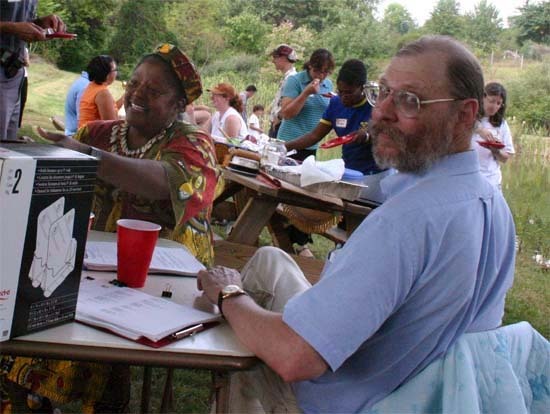 In September 2011 the Association will sponsor its 37th annual arts festival attracting artists from across the region who will come to Ponca City to display their work. "The Standing Bear Foundation was born to bring the two cultures together" says TL Walker, the Executive Director of the Standing Bear Foundation. "Having the Pow Wow is a way for the two cultures to come together in a social setting." Held in late September and hosted by the Kaw Nation, Osage Nation, Otoe-Missouria Nation, Pawnee Nation, Ponca Nation, and Tonkawa Nation, thousands of tribal members and citizens of Ponca City come together for two days to dance, sing, socialize, and honor American Indian culture. "The community of Ponca City and the community of all six tribes need to use the Pow Wow to celebrate together and embrace each other's culture with understanding," says Oliver Littlecook , member of the Ponca Nation. Ponca City resident Louise Fluke entered a contest sponsored by the Daughters of the American Revolution in 1925 and designed Oklahoma's state flag with an American Indian shield with a peace pipe, olive branch and eagle feathers against a blue background. In celebration of Oklahoma's centennial, the citizen's of Ponca City dedicated a Flag Plaza to honor Fluke. Fluke, who was only 25 when she designed the flag, was the 1982 recipient of the Pioneer Woman Award presented here at the Marland Mansion Renaissance Ball by then Governor George Nigh. In 1953, Alfred King, an Emporia, Kansas shoe store owner, had the idea to expand Armistice Day to celebrate all veterans, not just those who served in World War I and began a campaign to turn Armistice Day into "All" Veterans Day. A bill for the holiday was passed by Congress and President Dwight Eisenhower signed it into law on May 26, 1954. The observance of Veterans Day to November 11 not only preserves the historical significance of the date, but helps focus attention on the important purpose of Veterans Day: A celebration to honor America's veterans for their patriotism, love of country, and willingness to serve and sacrifice for the common good. The Marland Mansion was designed by architect John Duncan Forsyth and was built between 1925 and 1928 for Oklahoma governor and oilman E. W. Marland after Marland's trip to Florence, Italy where he was quite impressed with the Davanzatti Palace. Known as the "Palace on the Prairie," the 43,561 square foot house includes 55 rooms, including 10 bedrooms, 12 bathrooms, 7 fireplaces, and 3 kitchens and features Waterford crystal chandeliers, gold leaf covered ceilings, an elevator lined in buffalo skin, hand carved details in limewood and oak paneled walls, rich tapestry and sheffield plate wall sconces. The Mansion was purchased for $1.4 million by the City of Ponca City in 1974 funded by a one-cent sales tax. This page was last modified on 6 April 2018, at 17:32. This page has been accessed 7,243 times.